First post??? I NEVER do that! Still having internet problems. We decided to go to the fiber-optic option with our provider. Hopefully, their claims are true and it will speed things up. It's being installed on Monday. Fingers crossed. 2:28 - seems it's hard to do a fast sudoku while watching senate hearings... Good Morning all! Crazy post from yesterday - now good Maen from Texas where it is NOT raining right now. Oops, didn't see you sneak in there, tom! everybody, wide awake at 3am again Oh hum. Not sunny, but not rainy, either. Perfect day to replace a mailbox. Good mAen, good people. Another 1-&GT;9 solve. What gorgeous flowers on that cactus! We don't realize that cactus have flowers too. Note for today: Don't drive distracted!!! Someone hit our mailbox yesterday. Pieces flew 50 feet! Driver then fled at high rate of speed. 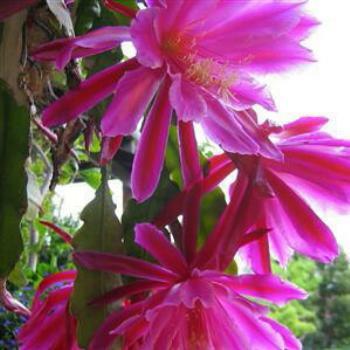 Morning all,our cactus has a few flowers out with lots of buds on every branch. Both of us enjoyed this story, Shiela. The resolution of the case was so much more effective than an anonymous ticket and fine. That young person will probably never again mess with her phone in the car or leave the scene of an accident. A good learning experience and a lesson in personal responsibility. Way to go, Coppers! Pleased you got reimbursed ,Shiela. Hope hubby doesn't damage his recovery. Oops! Amelia made me do it! Wow, straight 1 through to 9 today with a cactus flower at the end. I know your hubby enjoys his DIY projects, Shiela, but it's too bad 'taking personal responsibility' didn't also include coming back and digging the hole for the new post! I've grown cacti and succulents into the blooming stage so I laugh when I see tiny little cactus plants sold in stores with artificial flowers attached so it looks like they're in bloom. As well you should be, Arachnid! Lovely flowers... will never see them that size in Canada! Well lookie here, can I do it three days running ? just for fun, a CP. Another very long day. I work close to home tomorrow (5 blocks!) and later. I also work Saturday. My weekend is Sunday and Monday.